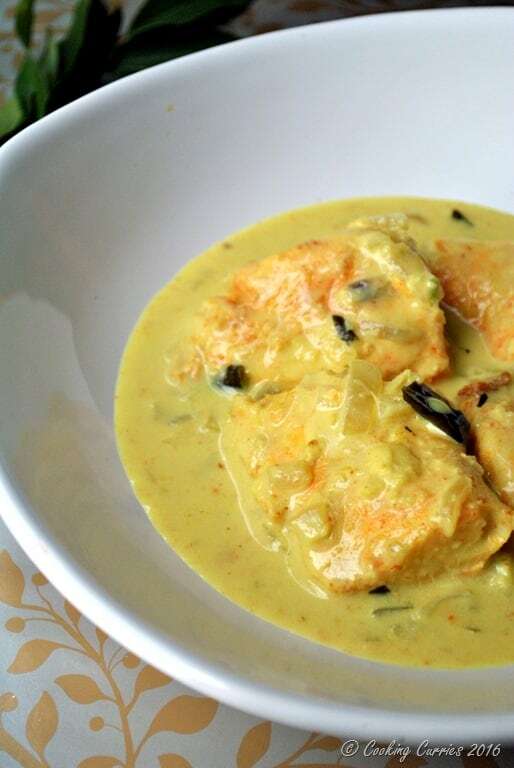 Delicately spiced fish curry with coconut milk, a Kerala special Fish Molee. If you have been following my blog for a while, by now you might be familiar that Kerala cuisine uses a lot, a LOT, of coconut – ground coconut, grated coconut, fried coconut slices, coconut milk and what not! 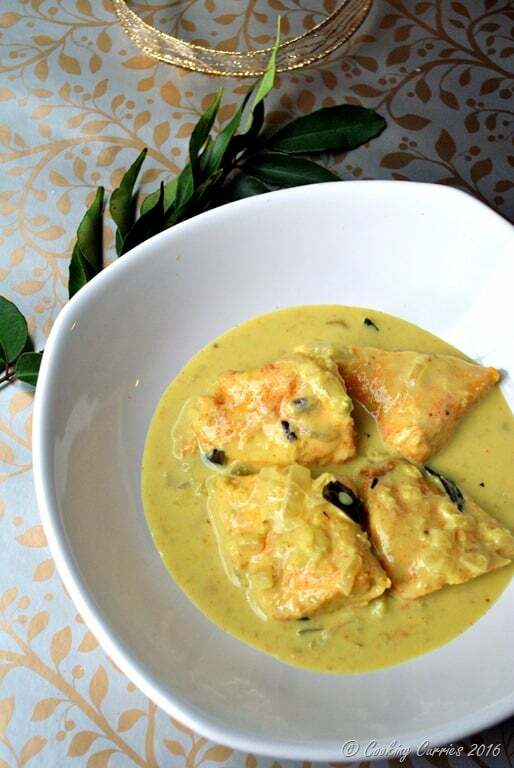 Of course, the coconut usage is not limited to vegetables and meat, we use it with fish too. 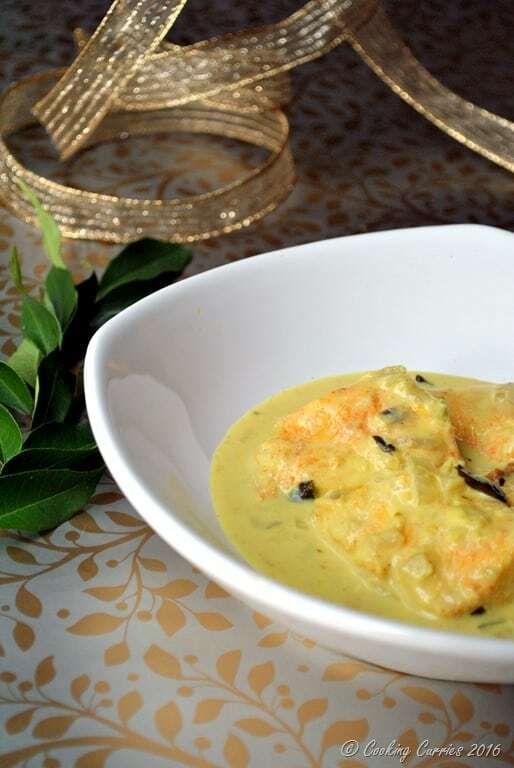 After all, seafood is as integral to Kerala cuisine as coconut is. This was my first time making Fish Molee and I looked around a little for how to make it. I knew that it is basically a fish stew but wanted to know if there was any specific way it was made or any specific spice was added or not added to make it Fish Molee. What I found in most places – internet and my cookbook collection , all pretty much said the same thing. So I went about making it and it turned out not that bad – pretty darn tasty infact. This time I had more taste testers than just the meat-a-holic, so it must be true! Cut each fillet into 3 inch pieces. Marinate the fillets in turmeric powder, red chilli powder, lime juice and salt and keep aside for about half an hour or so. Heat the canola oil in a pan and fry the fish lightly on both sides. Now remove the fish from the pan and drain on paper towels. Add the coconut oil to the pan, heat it and add chopped onions and curry leaves to it. Meanwhile, crush the ginger, garlic and green chilies together using a mortar and pestle. Add this crushed mix to the pan and saute well. Add the coconut milk and milk to the pan, let it almost come to a boil and add the fish to the pan slowly so as not to break them. Add salt and lime juice to it. Lower the heat to low-medium and let it cook for 5 mins or so. 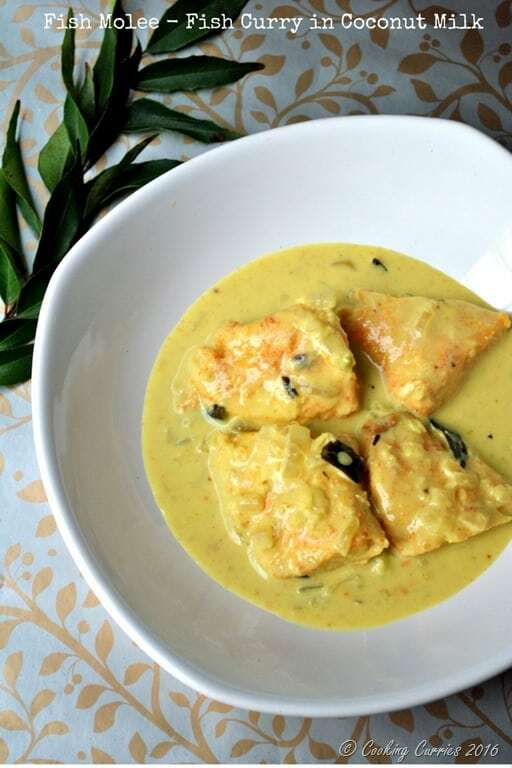 Serve hot with rice, appam, dosas or chapathis. Awesome fish recipe. We will make this at our home. Thanks for sharing. We will make this at our home. Thanks for sharing. I really enjoyed reading this post.